With the weather in the Everglades still being on the cold side, we headed north of Everglades City, to fish the west pass area . The first spot we stopped at was a mangrove island, that when at high tide, can hold a lot of redfish. 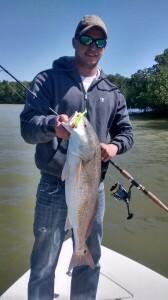 After anchoring the boat, it didn’t take long before we landed a nice 10 lb redfish, that hit on a riptide shrimp jig. We caught several more beautiful redfish, then we decided to head toward a deep creek. While at the creek, we caught a mix of sheepshead and trout . The weather is due to start warming up next week, so if you would like to get out on the water, and catch some fish give me a call!